"Turquoise and silver should be worn separately or banned." In Trucks, a group of people in a small community find themselves terrorized and oppressed by average, everyday trucks that have, inexplicably, assumed a life of their own. If the idea sounds familiar, it's because the film is based upon the same short story that was the inspiration for Maximum Overdrive, which was directed by the author himself, Stephen King. For some reason, I guess someone somewhere figured the film needed to be remade (probably because of the sub-dismal reception of Overdrive by the viewing public), and the result is this made-for-TV project, originally aired on cable's USA Network. At first, I was very critical of such an attempt to remake a film that, in my opinion, was fine the first time, even with its flaws. I tried hard, though, to clear my head and just view Trucks without making any comparisons to Overdrive. The story takes place in the town of Lunar, a small place in Nevada, very close to Groom Lake, better known as Area 51. So, the town is something of a magnet for UFO and paranormal aficionados, in much the same way that Roswell, New Mexico is. Hope (Brenda Bakke) runs a hiking, camping, and touring service in the town and is considered something of the odd-woman-out because she caters to incoming tourists for her trade. In any case, while bringing a group of three customers into the town one day, all hell basically breaks loose. Trucks begin attacking people and acting on their own accord. Eventually, she is among a handful of people left living in the town after the vehicular rampage, and they wall themselves up inside a small truck stop, figuring out how to escape or defeat the trucks. Unfortunately, Trucks makes a crucial mistake and expects all of this to be utterly horrifying and taken seriously. King's original short story was very much in his usual vein of wry, tongue-in-cheek horror ideas, where part of the charm to the tale is the cast of characters. Here, none of that is present. The setting and characters are totally different, as is the core plot. Whereas the original concept was that gasses from the tail of a comet caused "strange" things to happen, here the idea is that anything from chemical spills to the UFO sightings over the years are causing this to happen. At this point, comparisons to King's own vision in Maximum Overdrive beg to be made, with the most obvious being that the original is basically superior, or at least certainly more faithful to the spirit of the story. I will concede that there's a certain mood to this film that makes it seem fairly well crafted and earnest, but the main problem is that it isn't very scary. It becomes unintentionally funny when yet another character undergoes a totally avoidable, silly death, simply to rack up the body count. Trucks is one of those films where viewers will undoubtedly start screaming at the television at why the people are doing such dimwitted things and why they seem to lack most of the five senses gifted to humans. Alas, these people seem to want to be ruled by intelligent trucks. Image Transfer Review: While not anamorphically enhanced, the film is widescreened at 1:85:1. The image is soft and mildly blurry in certain portions, but it seems to originate mostly with the type of film used. However, the transfer seems to deal with it well, and noticeable compression artifacts are few and far between. The Southwestern landscapes (whether or not actually filmed in the Southwest) are rendered well with nice color schemes and moody cinematography, which seems to have no disc-related problems in coming across. Audio Transfer Review: The audio is formatted to Dolby 2.0 Surround, although I detected no surround channel usage. The front speakers are balanced reasonably well with music, sound effects, and dialogue; nothing is obscured or made hard-to-hear. The track isn't particularly adventurous or exciting, but it works well. My only complaint would be a certain lack of range in some sequences, leading to some flatness. Extras Review: There are three trailers featured on the disc, one for Trucks, and another two for other Stephen King-based films. This is the extent of the supplements (and unlike other Trimark discs, the Trimark logo isn't some hidden trove of additional trailers). Trucks is very much like most low-budget horror films, in almost any style. It has similar set-up, character types, and eventual resolution. 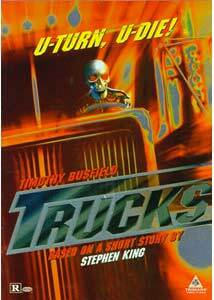 The automated trucks are simply the substitutes for an anonymous slasher or lurking creature, and the black humor of King's original story is totally absent. As a result, the film is quite disappointing despite capable direction.